Enlarge Photograph Made in polished 12mm stainless steel with stainless 4" ring and textured/moulded rubber perching surface. A brilliant innovation in perch surfacing which can be scrubbed and disinfected time after time without damage. This is a solidly built perch and not the usual undernourished and scrawny looking examples that can be seen elsewhere. Awaiting new photo. Weighing in at around 11 kilos or around 24lbs.weight. Constructed with solid stainless steel feet, stainless bow, 4" ring, cross rail and textured rubber perching surface. Made from 16mm, 304 grade stainless steel the really sturdy construction of these perches should last a lifetime. Postage on this hefty beast is £15.00. LARGE: Grade 316 Stainless steel with a 2" diameter ribbed rubber (stop it boys, let's keep it clean....ish!) perching surface and 15" -16" long. This perch is dead easy to keep clean, strong, virtually maintenance free and requires only two or four screws (stop it !) to fix in place as required. SMALL: As above but with approx.10"' long with 1" diameter ribbed rubber perching surface. 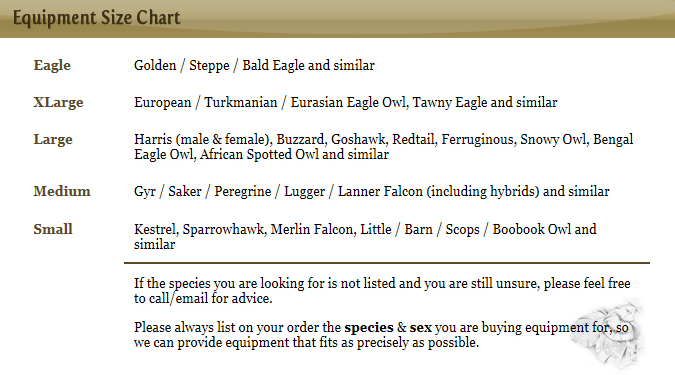 This size is suitable for Kestrel, Sparrowhawk, Merlin , small owls etc. 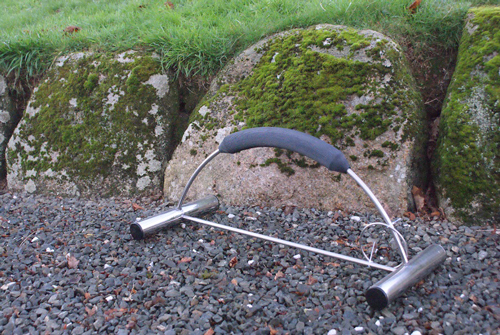 Turned from solid, black PVC with stainless steel spike, ground plate and integral tethering loop. 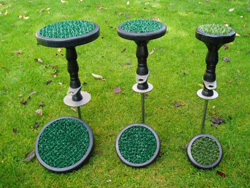 Tops are fitted with an Astroturf disc that is removable for cleaning and can be replaced independently should the need arise. Impervious to just about anything, indoors or out - a one off purchase. In common with all the block perches in this range, each and every individual PVC component is replaceable in the unlikely event that it should become damaged. 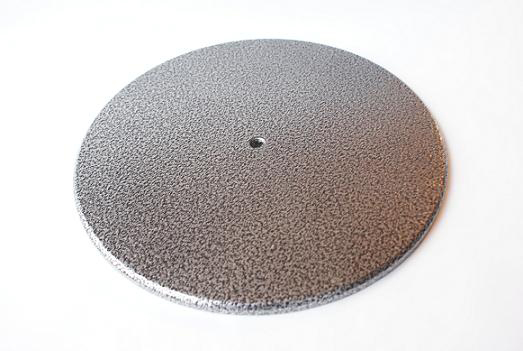 12� diameter, smooth powder coated ground plate (seriously heavy) 10mm thick steel, drilled and tapped. The current batch are available in the following colours........ Black, black black, black or black. Please state colour choice!!! NOTE: Currently only available in galvanised finish. Available in two sizes! These perch rubbers are designed to be used by anybody wishing to make their own bow perches or beating a burglar about the head with intent! The medium size is 11/2" x 16" long, the large is 2" x 17" long. Both are bored to accept 12mm bar but can be bored further to accomodate a larger bar size if you have the tools to do it. Each rubber has a fine ribbing (starting to sound at all familiar lads!?) that gives great grip but is still very easy to keep clean. NOTE: Awaiting new photos so not as shown...... better! Overall length is about 1.3mtrs. (1300mm) or about 4' 3" for us normal folk! SMALL: Same construction as above but with 1" diameter rubbed rubber perch surface and measuring 27" or 68cm. long. Carriage cost on this item is £11.50..............sorry! Ring Perches - Rotating - BRAND NEW! These sturdy steel ring perches come in three different heights. All perches rotate and have a sliding tethering point. The diameter of the ground plate is 7" (175mm approx) on all models. 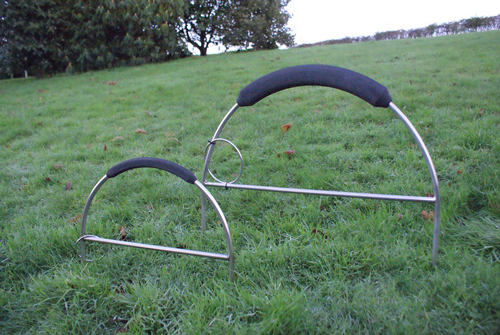 Carriage cost on the small and medium perch is £11.00 each and £14.00 for the high perch, unless you order more than one in which case we can do a better deal.